I started writing this post yesterday, but I have been having some technical issues with my website. I’ve been working on things for the past week. I think the technical troubles are fixed for now thanks to my hosting provider. There are still a few things I want to change and hopefully it won’t get messed up. I’m not sure if I messed something up or if there was something wrong with a specific file. It could have been anything. The options are endless. In this case, my persistence in dealing with this issue paid off. After the long week I’ve had, some baked goods were definetly in order. Luckily, I have a four day weekend so yesterday was my Friday. 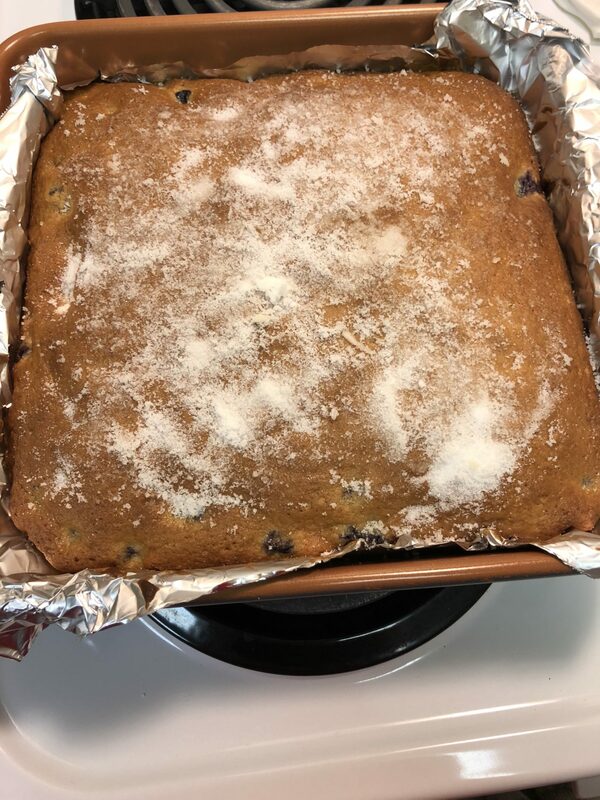 Last year I found this blueberry cake recipe. You can find it here. I don’t know who Alice is, but her blueberry cake is wonderful. Rosebud says this is delicious. She even started to help me make it, but she got bored and decided looking out the front window is much more interesting. Since spring is finally showing up, we were able to be outside today without any winter gear and enjoying the warm sun. It was a nice ending to a long week. Sometimes it’s the simplest things that make all the difference.